This is the spot to find my most recent articles and interviews with my favorite Clean Food advocates! Call me old-fashioned, but I want to sit down over a meal with my friends and family, lingering at the table, eating to fulfillment without rush, refilling water and wine glasses as we sink into a conversation. For me, meal time is not a one-act play. The table is the stage and it’s set to perfection with placemats, napkins, silverware and delicious whole food thoughtfully prepared. This is dinner time for me – social and intimate – and it’s going the way of the dinosaur. So when I came across Terry Walters’ cookbook Clean Food and read the introduction I felt like I had met a kindred spirit. Clean Food is a beautiful book filled with recipes that I ACTUALLY use. The book is divided into the four seasons and the recipes are then subdivided into appetizers, mains, and desserts for each season. The ingredients used are local and easy to find and, with an extensive glossary of ingredients in the first chapters, this is the perfect book for a beginner exploring their own clean-eating journey. You may recall I wrote about the vegan & gluten free soup that saved my bacon served to a delightful bunch on my last yoga retreat – it was the first recipe I tried from Clean Food. Instantly I became a fan. Luckily for this food nerd, Terry Walters agreed to let me publish her recipe and interview her! I actually jumped up and down like a tween at a Katy Perry concert at the sight of her email in my inbox. Mother Ship: What started you on your clean food journey? Terry: Growing up, my mom made our meals from scratch. We ate almost no refined sugar and there was already almost no animal protein in our diets. So when I was diagnosed with high cholesterol at the age of 20, it came as quite a shocker. I knew I didn’t want to go on cholesterol-lowering drugs, so I moved off campus, got an apartment with a kitchen and started teaching myself how to cook. One of the first doctors I met with told me I had to eat more brown rice and kale, but that first attempt was anything but appetizing! My first book, CLEAN FOOD, is a collection of the recipes and information I learned along the way. This approach has allowed me to balance my cholesterol, maintain my good health, heal my children and help so many others to do the same. Sometimes I think the journey has been even more nourishing than the food itself! Mother Ship: Eating Clean is not a fad diet – it’s a total lifestyle. Would you agree? How would you define or elaborate on this? Terry: I couldn’t agree more! Eating clean is not a diet at all. It’s about making healthy choices one at a time and doing the best we can. It’s about bringing the good foods in and letting those that don’t serve us fall by the wayside. There’s definitely no deprivation and no judgment. In fact, eating clean will look different for each person. For one, it might mean giving up artificial ingredients in their processed foods. For another, it might mean giving up processed foods altogether. And for yet a third, it might mean going straight to the farm. What’s important is that we’re empowered by knowledge and do the best we can, not reach a goal based on somebody else’s ideas. We each have a unique constitution and lifestyle. Eating clean allows us to listen to our bodies and nourish ourselves in a way that is quick, easy, nutritious and delicious so that we can enjoy sustainable good health. Mother Ship: A common complaint is that eating clean is too time-consuming. What do you do to prepare your fridge/kitchen and is this left up to you or does your family help you in meal planning and preparation? Terry: Rarely do I plan meals in advance! I keep mason jars in my pantry with a variety of whole grains, nuts, seeds, and legumes. I always have on hand the basics – extra virgin olive oil, sea salt, onions, garlic – and I go to the farm or grocery store once a week and stock up on produce with a mind to buy what’s looking best (in other words, what’s in season, organic and locally grown with extra emphasis on dark leafy greens). From there, I wing it! I might make a pot of millet one night and serve it with black beans, chopped avocado, and sautéed greens, and the next night turn the leftovers into millet black bean patties served with a fresh green salad. On nights when the pickings are slim, we could end up with rice tortillas from the freezer turned into individual pizzas topped with bottled sauce and leftover veggies. We’re creative, our meals are delicious and rarely do we spend more than 20 minutes preparing them. There are also plenty of times when I don’t cook. I have to hand it to my daughters – they come up with some pretty delectable clean food meals on their own! Mother Ship: Often our friends and acquaintances don’t share our Clean Food diet, how do you navigate social invitations in regards to your specific diet? Terry: Everyone pretty much knows my food preferences at this point, and I definitely don’t push my approach on others (aside from writing books, teaching, speaking…). I have two main approaches and which one I use depends on how I’m feeling and where I’m going. If I’m feeling like I need support, I share beforehand what I do and don’t eat. I find that helps me stay accountable to myself and true to my best intentions. Other times, I just go with the flow and eat what works for me. Even the least clean food dinners I’ve attended have vegetables and accompaniments that I can turn into a meal. And of course, I always offer to bring a dish. Not only do I enjoy contributing to the meal, but it guarantees there will be something I can eat on the table. I can honestly say, I’ve never gone home hungry! Terry: Well…first I would find out if any of you have any foods you’re allergic to or dislike that I should avoid. Then I would see what produce is particularly in season and delicious. I might look in my own garden, or go to a farmers market or my favorite farm. And I’d work from there, being sure there would be something for everyone! Last July, a local farmer had the most beautiful Ronde de Nice summer squash. I had never seen them before (think zucchini that looks like small bowling balls). I cut them into rings, grilled them and layered them with grilled cipollini mushrooms, fresh pesto and topped with chopped avocado and cherry tomato vinaigrette. Oh, my…so good I can taste it now! If Big Daddy P is a meat eater (his name alone makes me think this could be the case) I might add a grilled Portobello mushroom to the mix so he has something to sink his teeth into! A raw kale salad w/pumpkin seeds and fava beans for protein might be nice on the side. Or maybe a pasta salad with roasted tomatoes from the garden and wilted rainbow chard. For dessert, I think your 4-year old will enjoy making us all ice cream in my blender with fresh nuts, rice milk, vanilla, a hint of maple syrup and whatever else she might find in my pantry. I’ll pull it all out and put it on the counter so she can make it whenever she’s ready! We can top that with grilled peaches. How’s that? What time can I expect you? Mother Ship: Expect me? As soon as I can pack the car, pick up Big Daddy P from work, drive through the night – we’ll be there tomorrow – this dinner sounds divine! Mother Ship: I understand you offer cooking classes. If our readers wanted to join in, how do they go about it? Terry: All of my clean food cooking classes are listed on my website. That said, there’s nothing listed right now because I’ve taken the summer off from teaching to complete my next cookbook. It’s due out in the fall of 2014 and I’m super-excited about it! I will be teaching again come fall and will post that schedule in September. 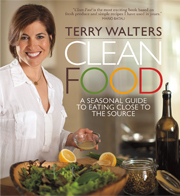 Meanwhile, I invite you and your readers to check out my website and blog here: http://terrywalters.net/ and definitely stay in touch and be part of the clean food conversation on Twitter @terrywalters and on Facebook on the CLEAN FOOD page! Mother Ship: Do you have a favorite go-to recipe in your book? Terry: I swear my “favorite” changes every day! This past weekend I was dying for my raw kale salad from CLEAN START. My girls love my grilled Cipollini onions with, and on, just about any and everything! Green Beans and Sweet Corn with Summer Vinaigrette is always refreshing, crispy and delicious. I’m crazy for peanut butter, and my Cucumber Noodles with Bok Choy and Peanut Sauce satisfies my cravings and makes my kids happy every time. I could eat my Curry Tempeh Salad for lunch every day, it’s that satisfying. Even people who think they don’t like tempeh love it. And I haven’t even gotten to desserts yet! Are you really going to make me pick just one? Great interview! My mouth is watering! I want to buy her book.